Calendars are one of those things that almost all of us have, but that very few of us ever use in way that does much for us. However, your calendar can be one of the most effective tools you have to make staying organized easy and effective. Since it’s the beginning of the semester, we’ve compiled a few tips on how you might be able to best use your calendar to keep all of your assignments and tasks from piling up into that mid-term avalanche. 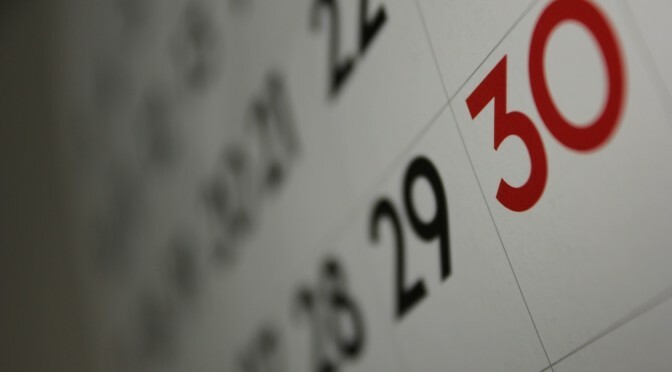 The first and best piece of advice concerning calendars is…use it. It may not be a flashy or even ground-breaking idea, but the best thing you can do to keep an effective calendar is to fill it up with your classes, job meetings, date nights, and anything else that you need to keep on track. A calendar with a host of empty days won’t help you keep ahead of your work, but a well stocked calendar will. Next, check it. A lot! Even if you’ve filled up your calendar with beautifully color coded items that would cause the most outrageous of organization freaks to swoon, they won’t do you any good if you don’t have a way to easily and quickly look at it. Your phone – smart or ‘dumb’ – can be a great place to start. Almost all phones now have the ability to keep track of your calendar and sync with many online calendars. For myself and a number of us at PERRLA, we like to use Google Calendar as an easy place to sync our calendars so that we can have access to them wherever we go. Here are some easy tips for using Google’s calendar. Finally, get into the habit of checking it. This is the easiest step for me because I can’t remember anything without having it written down somewhere! I’ve been told I would forget my own head if it weren’t attached to my shoulders. You may not struggle as much as I do remembering when and where you’re supposed to be – and I hope you don’t – but getting into the habit of taking 5 seconds to quickly glance at your calendar or jot down a new event can save you hours of time when you might be scrambling later on. Luckily for you, PERRLA is putting the final touches on an incredible tool that will help you stay organized, on track, and as productive as possible when it comes to staying organized in and out of school. Keep your eyes open because we’ve got some big announcements on our own calendar that will help you get even more out of your busy calendar.